Each year the Ontario Federation of Ornithologists (OFO) Board of Directors recognizes individuals and organizations for their outstanding contribution to the birds and birding community of Ontario. 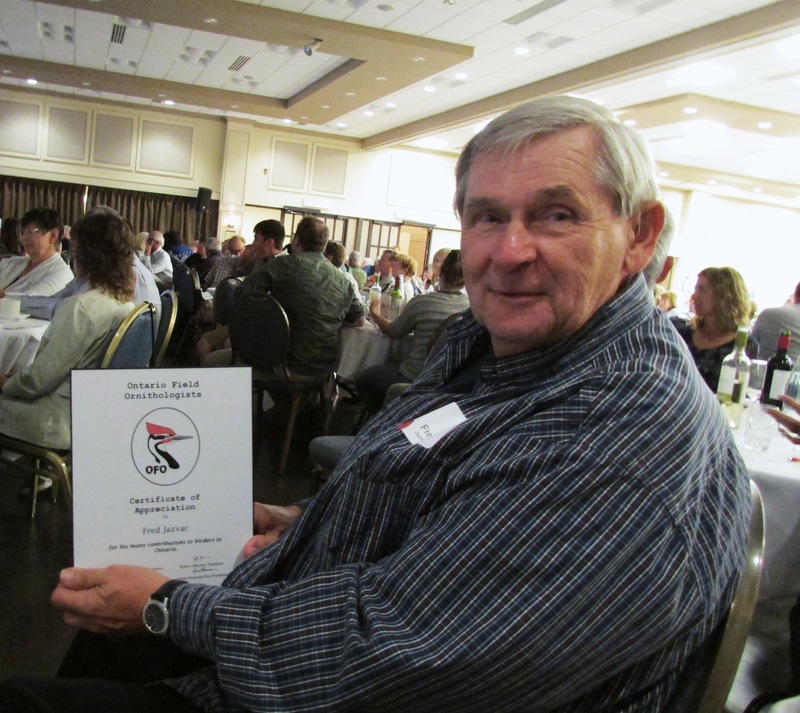 Last Saturday night, at the OFO Banquet in Ottawa, Fred Javac was presented with a Certificate of Appreciation. Fred was nominated partly for his role in the Bruce Birding Club (BBC). Many of us know Fred because he initially welcomed us to the BBC. He has been there from the start and through gentle encouragement and teaching ability brings out the best birder in us all. Fred is not only the foundation of the BBC but is the common link that keeps us all bonded together. Thanks Fred, for all you have done to commence, oversee, and make the BBC such a great club. Congratulations, your award recognizes your dedication to the BBC. But, the BBC is only one of the recipients of Fred’s love of birds. The Huron Fringe Birding Festival also benefits greatly by his participation on committees and as a hike leader. Fred’s presentations are often to a full house. He has a way of making complex families like the sparrows comprehensible. Because of his love of teaching Friday nights are now set aside to be teaching programs. Congratulations from the HFBF. The full program will be available on-line January 15th 2015 on the Friends of MacGregor website at: www.friendsofmacgregor.org. Be sure to mark your calendars with next year’s dates…May 22nd to May 25th and May 28th to May 31st, 2015. Registration starts on February 1st, 2015. Follow us on Facebook http://www.facebook.com/HuronFringeBirdingFestival.